Spray function gives you a total clean up to 10 feet high. Adjustable jet at the scrubbing head allows the direct application of solution to surface. The specially designed flip clip lets the user make super fast adjustments to the telescopic pole, reaching to over 10 feet. Aluminum handle with soft rubber provides extra control. IP67 rated waterproof switches. Solid stainless steel LEMO electrical connection for ultra reliability, "military grade". The 0.21 gallon tank is securely and neatly contained within the backpack. It can be easily removed and replaced for quick refilling. Commercial grade high pressure pump delivers cleaning solution through the coiled waterpipe, hidden inside the telescopic handle, to be sprayed at the scrubbing head. Super comfortable backpack with padded shoulder and waist support. Super portable, you can clean walls and floors with a variety of coverings, it's ideal for all hard to reach areas. Weighing only 5.5 lb (7.7lb with harness) it is extremely lightweight to use yet heavy duty in its construction. 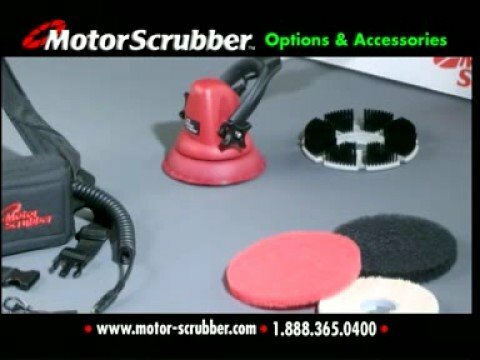 The Motor Scrubber is 100% waterproof and submersible in water with no shock risk due to its extra low safe voltage. The reliable high torque motor allows for fantastic washing, polishing and cleaning results upto 10 feet high.